NETWORK UPDATE: The only adjustment from this morning’s numbers was a 0.1 bump for AMERICA’S GOT TALENT. CABLE HIGHLIGHTS: PUBLIC MORALS had a very unpromising premiere for TNT at 0.28, putting it 0.09 below the premiere of PROOF in June, and 0.05 below last week’s season finale. Its lead-in was a bit smaller–RIZZOLI & ISLES was down 0.11 from last week to 0.63–but considering that shows usually decline from their premiere numbers, the new series is already in trouble. In brighter news, OWN’s THE HAVES AND HAVE NOTS took the night, up 0.11 to 0.98. On Spike, INK MASTER was up 0.05 to 0.75, while TATTOO NIGHTMARES lost 0.03 to 0.38. TOSH.0 returned to Comedy Central at 0.67, helping to boost the season finale of ANOTHER PERIOD by 0.12 to 0.31. On History, 2 episodes of COUNTING CARS were at 0.59/0.53, above last week’s 0.50/0.42, with lead-out OUTLAW CHRONICLES at 0.39. TLC’s LITTLE PEOPLE, BIG WORLD jumped 0.19 to 0.57, and OUR LITTLE FAMILY was at 0.34. On Bravo, REAL HOUSEWIVES OF NYC slipped 0.02 to 0.55, and lead-out BELOW DECK was at 0.42. HBO’s HARD KNOCKS scored 0.05 more yards to 0.49. REAL HUSBANDS (BET) fell 0.13 to 0.44, and PUNKD fell 0.11 to 0.35. FX’s TYRANT gained 0.06 to 0.42. TOTAL DIVAS (E!) dropped 0.06 to 0.39. FACE OFF (Syfy) edged up 0.02 to 0.38. 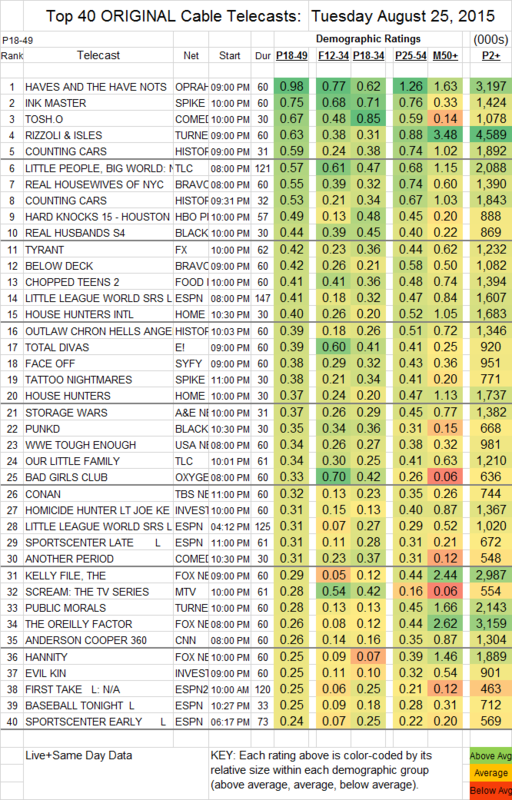 On USA, WWE TOUGH ENOUGH ticked down to 0.34, and PLAYING HOUSE fell 0.03 to 0.17. MTV’s SCREAM lost 0.02 to 0.28 (and was down 0.12 in the F12-34 demo to 0.54). ABCFamily continues to have no luck in the unscripted realm, with MONICA THE MEDIUM at 0.14, NEXT STEP REALTY buried at 0.04 (down 0.03) with 95K total viewers, and STARTUP U even worse at 0.02 (down 0.04) with 47K total viewers. BIG BROTHER AFTER DARK (POP) was at 0.02/68K.